Sorry for the lack of posts last week but things got pretty crazy. A lot of office work and evening meetings kept me busy and away from the farmer’s market, grocery store and kitchen. You may have noticed I didn’t put together a meal plan last week. Well, that’s because I didn’t have a plan and we weren’t eating anything spectacular last week! I made the Tex-Mex Lasagna from the previous week on Monday night so that we could eat on that all week and we had salad fixings in the frig. Of course we still have plenty of our frozen, homemade green chile and cheese tamales to pull out as well. Well, yesterday I made it to the farmer’s market and came back with a great haul. It was a beautiful cool morning with the smell of roasting green chile in the air. I found Poblano peppers, shishito peppers, tomatillos, yellow finn potatoes, garlic, a pie pumpkin, Anasazi beans, peaches and baby bok choy. I will be sad when the market ends, and although there is a winter market, it isn’t as bountiful. My allergies are ready for a good frost to kill off the allergens but my taste buds want the good food to stick around! Our own garden is still producing; mostly cucumbers, peppers, tomatoes and some okra. The 2 (only!) pie pumpkins and 4 little butternut squash are still hanging on the vines in the sun, curing. And with the cooler temperatures, the Swiss chard has taken off so I need to harvest and cook some up. So here I sit now, trying to figure out what to do with all the great food we are so thankful to have. Also on my mind is a little road trip coming up next weekend. I am trying to keep in mind how much food we’ll eat this week, how much time I’ll have to make it and what can be left in the refrigerator over the weekend. I know there are some great gluten-free-friendly places to eat around Phoenix so I am not too concerned with getting enough safe food, but I always like to take food with me, just in case. As well, eating breakfast out is typically hard for me since I can’t eat scrambled eggs or an omelet these days. So I definitely like to take breakfast foods along with me. I will let you know how things go next week! 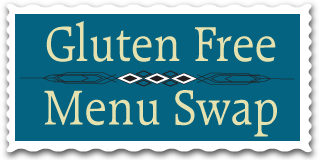 This week’s Gluten Free Menu Swap is hosted by Cheryl at Gluten Free Goodness and the theme is cinnamon. Cinnamon is definitely a wonderful fall flavor. I don’t use cinnamon a whole lot since I don’t do a lot of baking but I recently made Pumpkin Chocolate Chip cookies and they have cinnamon in them. If you want some more cinnamon ideas, be sure to check out the compilation post over at Gluten Free Goodness; Cheryl already has a few cinnamon recipes linked up on her page and others will follow. Smoky Mexican Lasagna from Vegetarian Planet by Didi Emmons – I made this tonight – wonderful with the smoky chipotle pepper flavor. Indian Stew from Vegetarian Planet by Didi Emmons – to use up the okra from our garden. Can you tell what my new favorite cookbook is? So many recipes in here and so many that sound great. I grabbed this cookbook off of Paperback Swap. Also, I harvested and shelled some of our homegrown Anasazi beans this weekend after picking up a big bag at the market. This was the first year we have grown them. Have you ever cooked with them? The man at the market that I bought them from said that I will be sorry that I bought them, but only because I will want more! When I asked him what the best way to make them was, he said he makes them just like he makes pinto beans, which is very New Mexican. 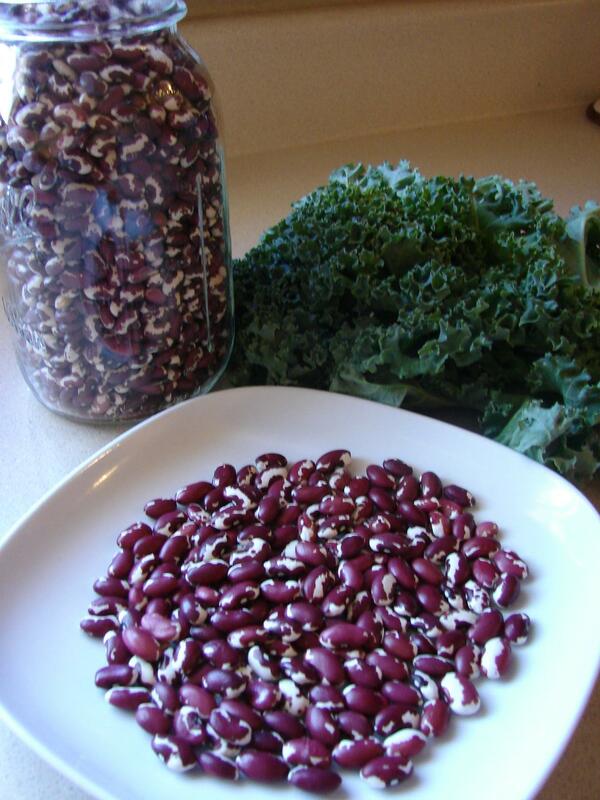 I don’t know how to make New Mexican pinto beans, so I guess I will go out trolling the interwebs for some ideas. In the picture below, the ones in the jar are from the market and the ones on the plate are from our garden. I need a bigger garden to plant more of these beauties – and unlimited water! I have Steve Sando’s Heirloom Beans cookbook but most of the recipes rely heavily on meat, so I am looking for any vegetarian ideas you may have! What a great haul from your farmers’ market. Such bounty. I missed ours the last two weeks with travel and being sick and it only goes until the end of October. Gotta get there this weekend. Love the sound of that Smoky Mexican Lasagna. I love heriloom beans. and the lasagna sounds delish! Please post pics of your garden. I’ve never seen a butternut growing. Granted, I have pumpkins so I have the general idea, but I’d love to live vicariously through your garden. kicking myself because i’ve never been to your blog before! I always get these super sweet comments from “beyondriceandtofu” and somehow never googled you until now! What a mistake!! What a lovely blog! I love that you do a menu plan, I am ALWAYS looking for menu inspiration! And isn’t paperback swap the best? I’m too lazy to mail books out, but I use the 3 for 10 something dollars… it’s such a bargain!! Can’t wait to read more!! I have a question….I used to own the Vegetarian Planet cookbook by Didi Emmons, and lost it in a house fire. I have been searching and searching for the Poblanos rellenos recipe for months, as a friend is coming from out of town and it was her favorite dish I made….I’d love to make it for her again. Could you email me this lovely recipe? I came across your page here, and was hoping you’d post a link, but I didn’t see one. I’d try to make it from memory, but that’s not terribly reliable these days.